Gutenberg, the story goes, was inspired to build his printing press from the mechanics of a wine press. Who knows if that’s true or not, but I’ve always loved the idea that the most important invention in the history of the world sprang from a way of making alcohol. 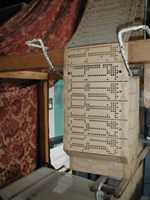 No less interesting a story — though certainly better documented — is the degree to which the automated weaving loom created by Joseph-Marie Jacquard in 1802 inspired punch-card controlled computing and, arguably, the entire notion of separating data from the control program in an automated system. I’ve got some history of fascination with the loom as a metaphor for computing and so I was naturally drawn to James Essinger’s new book on Jacquard and his loom. The book is about 100 pages too long and too strident in its claims about the importance of the loom to the history of computing overall, but it is not a bad book at all: controlling weaving patterns with punch-cards did in fact inspire Charles Babbage and Herman Hollerith to do the same with their computing and tabulating engines. What’s most interesting to me is the historical prevalance of the computing-as-weaving or computing-begat-from-weaving motif. Though Ada Lovelace was probably the most articulate in portraying the linkage, the idea has never been so much a part of the popular imagination as it is today in the World Wide Web. Arachne’d be proud.